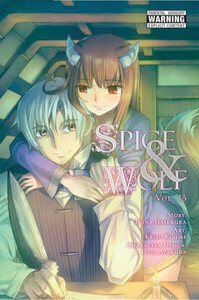 Lawrence and Holo draw ever closer to the wisewolf's homeland of Yoitsu. But as they near the final leg of their journey, the two of them hear about a mercenary band that shares its name with one of Holo's oldest companions, Myuri. Their investigation brings them to the astonishingly prosperous town of Lesko, a place seemingly overflowing with opportunity and success. But Lawrence has never heard of a town that has no walls or tariffs. How could this be? More importantly, what connections do the Myuri mercenary band have with Lesko's masters, the mighty Debau Company?